Sarracenia ‘Narrow Throat’ is a Sarracenia alata hybrid of uncertain, but likely hybrid parents. The parents were purchased from Hwa-Jin Lee of carnivorous plant farm (Green Shark) in Hanamsi, Gyeonggi-do, Republic of Korea. The crossbreeding of the parent plants was done by Jae-Hwan Lee in 2007. A few months later, about 100 seeds were separated. After cultivating for 2 years, one of the plants was selected and named ‘Narrow Throat’. The upper part of the pitcher tube is yellow and the lower part is green (Fig. 1). Red veins are spread evenly. The pitcher is about 40-60 cm long. The diameter depends on the height of the tube, but many are under 1 cm in diameter. The operculum is about 2 cm long and 2-3 cm wide and is entirely yellow with a red edge. The ends are bent around hazy red veins. The peristome is very thin and usually yellow, but sometimes a little reddish. The wing tends to be extremely wavy, becoming more severe in a hot climate. There are many cases when the width of the wing, about 2 cm, is longer than the diameter of the tube. The length of the wing is the same as the pitcher tube. 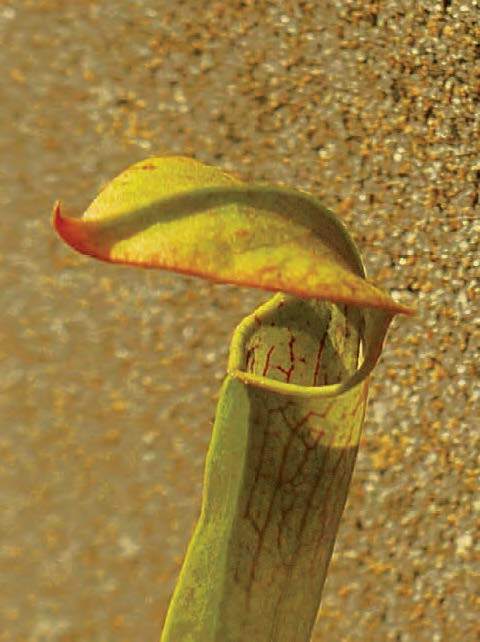 Due to its small size, the pitchers have difficulty catching bugs. Digestive fluid also has a tendency to be wholly depleted at high temperatures, so it needs to grow almost through photosynthesis. The flower is mostly yellow or green. The bract is green with some brown. The petals are a bright yellow. It can bear seeds, but few in number. The name ‘Narrow Throat’ reflects the difficulty of catching bugs and quickly drying digestive juices. This cultivar should be reproduced asexually only. 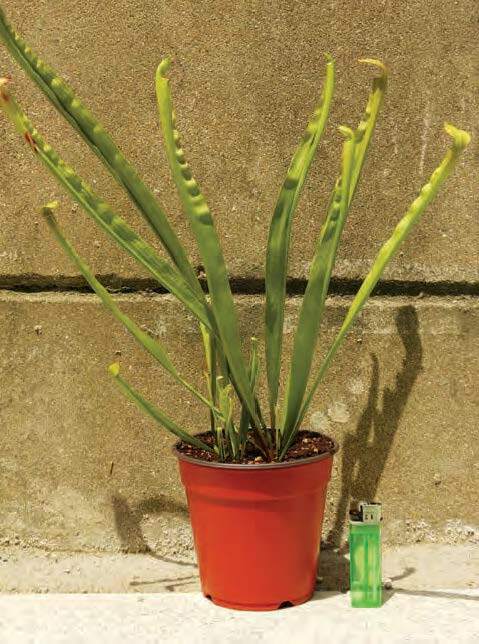 Figure 1: Sarracenia ‘Narrow Throat’ pitcher and plant. The parents of Pinguicula ‘Giant Green Violet’ are Pinguicula zecheri and a Pinguicula agnata hybrid. About 100 seeds were germinated in an interior greenhouse in winter 2007 by Jae-Hwan Lee. One of these plants showing great color and growth rate is ‘Giant Green Violet’. This cultivar usually grows much faster and healthier in wet soil than in dry soil. 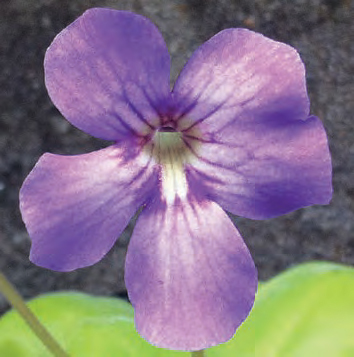 The color of the flower is light violet and a violet vein on the petals has irregular patterns (Fig. 2). Sometimes petals can be fused or grow in an unusual, overlapped, or dislocated form. The petals are 2-3 cm long and 1.5-2 cm wide. The 10-cm flower stalk is brown and is usually stretched forward. The spur is 5-8 mm long, is entirely green, and grows in a curved shape. The mostly green leaves are 7-9 cm long and about 4 cm wide and do not become red in strong sunlight. On old leaves, a portion of the vein will have some brown color. The name ‘Giant Green Violet’ was decided on 14 January 2013. The name ‘Giant’ suggests a large and vigorously growing plant, ‘Green’ is for the color of the leaves in the strong sunlight, and ‘Violet’ for the color of the flower. Table 1: Differences of Pinguicula ‘Giant Green Violet’ from similar cultivars. ‘Giant Green Violet’ Green with a light brown vein scattered irregularly; not wavy; tips grow downward. Petals mostly wavy, sometimes fused; light violet with small random white patterns; violet veins with irregular patterns, darker toward center. ‘Gina’ Light green with a light green vein; wavy; slightly rolled up on margins. Petals sometimes wavy; dark violet center, white middle, and light violet outer; light violet vein scattered irregularly; corolla mouth marked by yellow band. ‘Tina’ Green or light green with a light green vein; occasionally wavy. Petals sometimes wavy; pale violet (mauve) with dark violet near center; violet veins darkest near center; white throat. 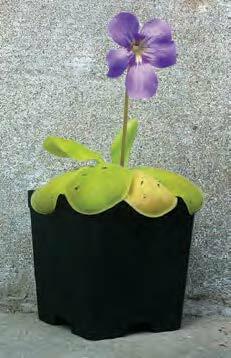 Figure 2: Pinguicula ‘Giant Green Violet’ flower and plant. 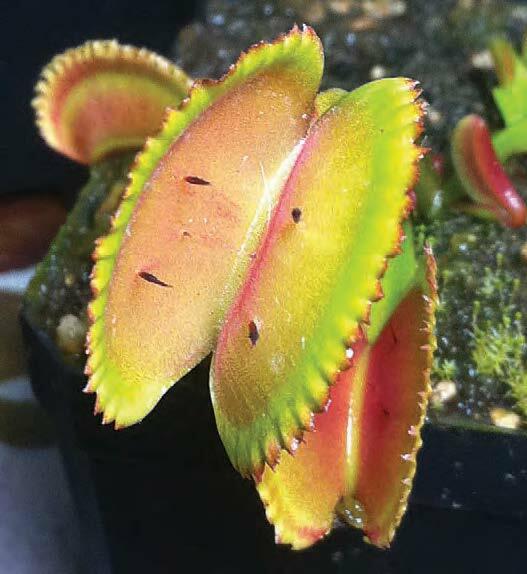 Dionaea muscipula ‘Red Neat Trap’ was produced by breeder Jae-Hwan Lee in summer 2008 by crossbreeding a red form Venus flytrap with a form having many teeth. The inner side of the trap is always red or dark red, becoming darker toward the center (Fig. 3). There is some red color and a red line on outer side of the trap. The trap is 2-2.5 cm long and 1-1.5 cm wide. There are about 21 red teeth about 8 mm long. There are 3-6 black trigger hairs about 3 mm long with some additional small trigger hairs. The petiole is about 2 cm long and 4 mm wide. The color is mixed green and red with a red line in the middle. The plant usually grows upright in a hot and humid location with strong sunlight. The flower petals have some red, similar to the all red forms. There is one pistil and 15-16 stamens. It produces seeds normally. The stalk is about 15-25 cm long with 5-9 flowers. There are 5 calyxes. The name ‘Red Neat Trap’ was decided on 12 January 2013 because it is entirely red and has a neat appearance. Figure 3: Dionaea muscipula ‘Red Neat Trap’. Dionaea muscipula ‘Viper Trap’ was created in June 2007 from artificial crossbreeding between parents having a dentate form. The female parent was purchased in Yangjaedong Flowering Plant Joint Market, Seoul by breeder Gun-Ju Kim, and after being cultivated for about a year, it was transferred to the breeder, Jae-Hwan Lee. The origin of the ancestor is likely the Korean Carnivorous Plant Institute. The male parent was cultivated by Jae-Hwan Lee. About a month after pollination, about 20 seeds were sown in the appropriate environment. Most of the seeds germinated and were grown for 2 years. One of the siblings is ‘Viper Trap’. Most of the inner side of the trap is a pink color (Fig. 4). The outer side of the trap is mostly green but often has a pink line. The trap is about 2.5-3.5 cm long and about 1.5-2 cm wide. The teeth are very short, 1-2 mm, and irregular. The edge can be pink, depending on the environment. The trigger hairs have a unique appearance. The two at the top are large, about 5 mm, while a pair at the bottom are either similar to those of typical Venus flytraps, 1-2 mm, or may have traces only. The trigger hairs are reddish brown or black. At maturity, petioles, not including the trap, are about 7-10 cm long and 4-7 mm wide. The petioles are mostly green. During initial formation, they temporarily have a pink color. The plant form is an upright type. The flower has one pistil and 13-17 stamens. The flower stalk is about 20-35 cm long and bears 4-11 flowers with 5 calyxes. It produces seeds normally. The name ‘Viper Trap’ was decided on 12 January 2013 because the trap looks like the mouth of the viper and a trigger hair on the inner side of the trap looks like the teeth of the viper. The teeth on edge of the trap are similar to the scales of the viper. 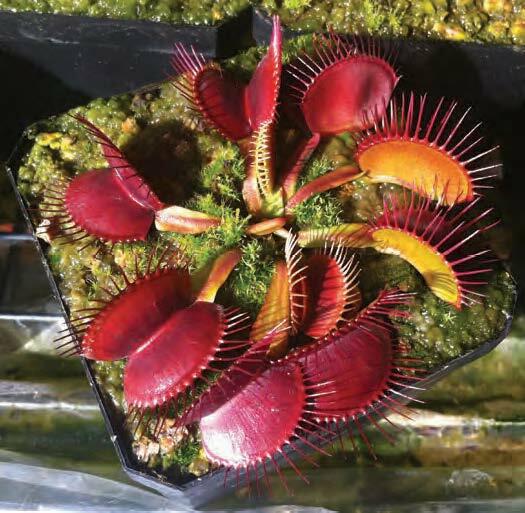 Figure 4: Dionaea muscipula ‘Viper Trap’. Note the unique trigger hairs. Dionaea muscipula ‘Orange Neat Trap’ was produced by breeder Jae-Hwan Lee in summer 2008 by crossbreeding an orange form Venus flytrap with a form having long teeth. The inner side of the trap is mostly orange or sometimes pink (Fig. 5). Some observers may believe the color is red, but the there is a clear difference between the color of ‘Orange Neat Trap’ and ‘Red Neat Trap’. There is a faint orange line on outer side of the trap. The trap is about 2 cm long and 1 cm wide. There are an average of 16 red teeth that are about 1 cm long — somewhat longer than those of typical plants. The arrangement and length of the teeth is very regular. There are 3-4 reddish trigger hairs about 2 mm long. The petiole is about 3 cm long and 5 mm wide. There is some red color and a red line in the middle of the petiole. The plant usually grows upright in a hot and humid location with strong sunlight. The flower has one pistil and 13-15 stamens. It produces seeds normally. The stalk is about 15-25 cm long with 4-8 flowers. Occasionally 6 calyxes have been found. The name ‘Orange Neat Trap’ was decided on 12 January 2013 because it has a neat appearance and usually has an orange color. Figure 5: Dionaea muscipula ‘Orange Neat Trap’. In 2008, breeders Jae-Hwan Lee and Gun-Ju Kim selected normal Venus flytraps that had a rapid growth rate. These plants were crossbred by Jae-Hwan Lee. About a month later, about 200 seeds were collected and sowed. After a year of growth, one of the young plants showed a very rapid rate of growth. This plant was named ‘Small Fast’. ‘Small Fast’ changes every day even during dormancy. The inner side of the trap is red with differing tones (Fig. 6). The outer side is usually green, but it can be slightly red, depending on the environment. The trap is about 1.5 cm long and 6-8 mm wide. There is an average of 15 teeth per trap that are 3-5 mm long with an irregular array. When the teeth are dark red, their edge is white. The trigger hairs are mostly red, white, or transparent. There are usually 8 trigger hairs about 2 mm long, 2 pair on the bottom and 2 pair on the top. The length of the petiole is similar to the length of the trap and can be somewhat red, depending on the environment. The petiole is about 1-1.5 cm long and 3 mm wide. The flower has one pistil and 14-16 stamens. It can produce normal seeds. The flower stalk is 15-20 cm with 5-9 flowers. There are 5 calyxes. The name ‘Small Fast’ was decided on 13 January 2013. 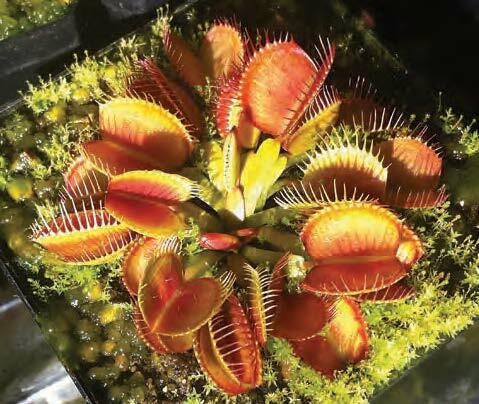 ‘Small’ reflects it is half the size of normal Venus flytraps and ‘Fast’ reflects its faster rate of growth. 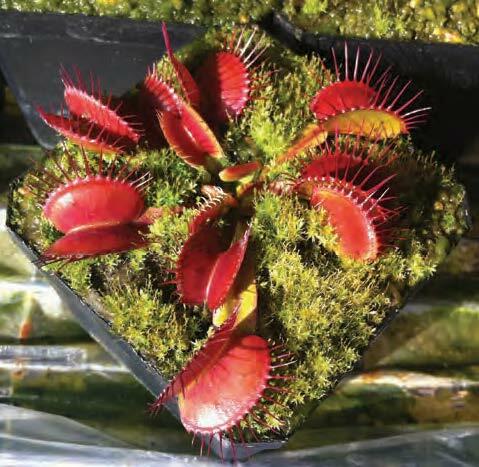 Figure 6: Dionaea muscipula ‘Small Fast’. Note the white and transparent trigger hairs.